iPhone as a Home Theater Controller! For many years I have searched for the ultimate ease of use in a Home Theater. You know what I mean! I’ll bet there are 3-7+ remotes lying about on your coffee table and that your significant other and kids can’t figure out how to put on a movie to watch! I have tried all kinds of solutions and the best thus far was a Logitech Harmony Remote. It still required scads of programming, but at least it worked pretty well with most components. It was my defacto system for several years. But these remotes have upwards of 50 buttons and can still be a bit daunting. Then I came across a Yamaha NEOHD. What a fascinating piece of kit! 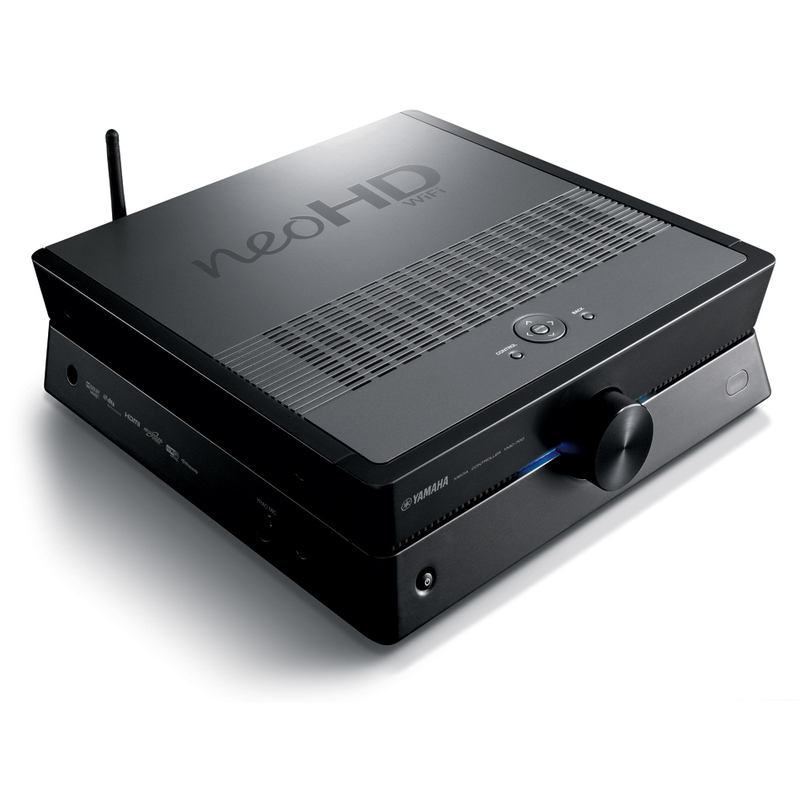 It is a very non-traditional a/v receiver in that it includes Wifi, can support an iPod, and has NO UI at all by itself. The remote is even more odd with it’s paltry buttons. According to Yamaha, everything plugs into this one slimline box and it becomes the central control for everything. Hmm, that got me thinking and reading more about it. I mentioned this to an old friend and she thought it would be cool for both of us to get one if I would help her figure it out. Basically I get to be the tester for this unit and find all the warts before she had to commit. Well, I am a sucker for new cool technology. However, one thing put me WAY over the edge. Not only can you control this thing with it’s ultra simple remote, but get this. You can use your iPhone! Almost all the functions of your system can be controlled from an iPhone app. Can’t find the remote, whip out your iPhone. Listen to the radio (streamed from the internet) and then shut it off as you walk out the door with your phone! How cool is that. Here’s a few shots of the UI. Is that crazy or what? You can choose to Watch and then choose your cable box, Blu-Ray player, streaming Roku box, whatever. The Play will hook you to your Xbox and Wii, then the Listen gives you FM, Internet, and iPod! Now the control is not just high level control. Check out this shot of the Blu-Ray player screen. You can basically control anything in your components from your iPhone. How this works is that there are little IR blasters that come out of the back of the NEO unit and then you have to place the blasters over the sensors in your components. The NEO knows the codes you need and will send them to the proper components. So does it all work? Yes, but not without a few hours of frustration. As it turns out, it’s not so easy to figure out where the IR sensors are in your components. They are all “dark” so as not to disturb the styling. The trick is to use a very powerful flashlight and search along the perimeter of your devices for a break. It’s not always easy. Until I found the right locations, nothing worked because the signals were not being transmitted to the right place. It was a bit frustrating. I called Yamaha a few times and I can tell you that their support is not the best. OK, it was horrid. After multiple tries to reach them, I finally got someone who basically said the unit it so new that they need to pull up the manual. Someone was going to call me back with more info. That was a few days ago. Meanwhile, I figured it out by myself. So I won’t go over all the features, you can see it on their website along with some great videos. I can tell you that it all works very well once the proper setup is complete. The amp is not as robust as my old Sony ES, but it works plenty fine for my application. Bottom line? Great integration, Nice on TV screen UI, super feature set, easy to use. Setup – not so much. At $800 it’s a bit much, but they recently dropped the price to below $500. A very interesting hybrid device indeed!